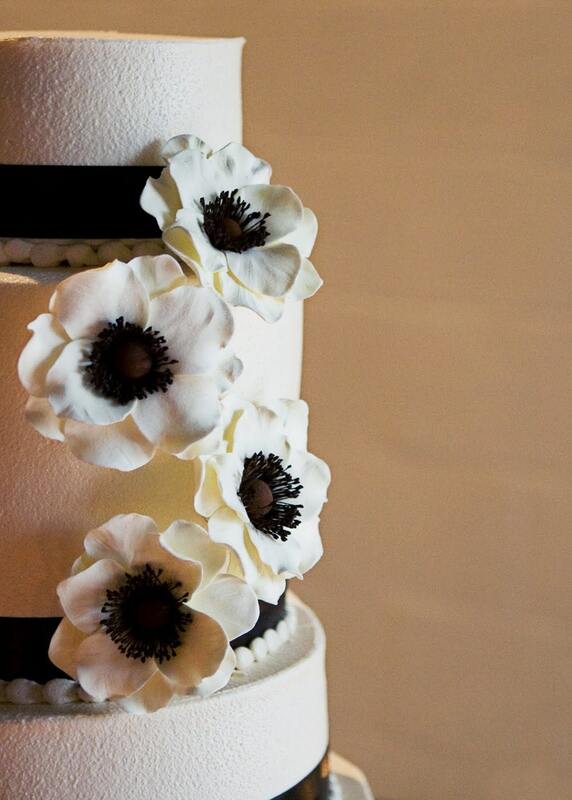 These are for white and black centered anemone cake flowers perfect for a black and white wedding.. This listing is for 3 anemone 2 of 3 inches and one 4 inches. Please note the entire set in picture of 4 would cost $80. Anemone are not hardy and very difficult to find during off season.The flowers are made from floral clay which is not brittle and are very lightweight yet very hardy.They are perfect as a keepsake after the wedding wipe dry and shadow frame them! -Use the option white with black centers if you want black and white.. This was done custom for a bride -the cake inspiration picture is up at http://stjudescreations.blogspot.com/2010/01/gumpaste-anemone-wedding-cake-flowers.html so do check that out..
Do convo me or write a note at checkout for other customization.Custom colors are also available. Do you like my flowers? Then you would love my new book "How to make 100 Paper Flowers"
I received my anemone flowers yesterday 2/19/2015 and they are beautiful. I can't wait to put them on my wedding cake come May! Thank you Maria! I will be posting pics after the wedding... stay tuned! These flowers are amazing! I wanted anemone flowers so badly in my wedding bouquet, but they aren't available in August. Then I found these and I am going to have them on my cake instead. They are so perfectly made, they look real. I strongly recommend them! Thank you so much!! Turned out perfect!! I received my flowers yesterday 2/19/2015 and they are beautiful. I can't wait to put them on my wedding cake come May! Thank you Maria! I will be posting pics after the wedding... stay tuned! WOW!! Flowers are absolutely stunning! I could not be happier with how they turned out and cannot wait to see these on my wedding cake which will tie in perfectly with my reception around a lily pond I'm the botanical gardens. Flowers are beautiful and exactly what I asked for and will hold up great, I can tell! Also, communication was excellent with super quick responsiveness and she was so willing (and able) to work with my customize sizes etc. Quality, communication, and quick turnaround worth the price. THANK YOU from the bottom of my heart :) Anytime I need another flower I will definitely be back. Maria was kind enough to send me a sample flower to look at before I made a fianl decision. Sample flower was stunning so I decided to order 2 dozen. Thank you! I accept payment via PayPal or personal check. Payments must clear before your purchase will be sent. CT residents: Add 6.35% sales tax. That amount will be added automatically if paying through PayPal. If paying by check, please wait for a revised amount from me via Etsy conversation before sending your payment. Depending on the size/intricacy of your custom order, a deposit may be required and must be received before work can begin. The deposit can be set up via Etsy or PayPal. We want you to be happy with your order and will strive to give you a excellent description of your purchase using the pictures and worded description in the listing. If you're not satisfied with your purchase, you may return the item(s) within one week of receiving it for a full refund, less shipping and handling. If your order was a custom order and a deposit was required, you will receive a refund, less the deposit and shipping and handling once your item(s) have been returned. Custom wedding related orders are not returnable. I ship my items via USPS with Delivery Confirmation (except for international orders). Padded envelopes usually go First Class and boxes are sent USPS Priority (unless they're light enough to go First Class).Please request quote if you need insurance as the shipping does not include insurance. If you need something sooner than the 2-6 day average time period, expedited shipping can be calculated. Just let me know. ADDRESSES - if the address on your Etsy account is not the same as the address on your PayPal account, please specify in the 'notes to seller' section at checkout to which address you'd like your item(s) sent. Also, if you're purchasing something as a gift and need it sent to the giftee directly from me, be sure to include that address in the 'notes to seller' section. We will not be responsible for any loss or damage related to our products. Due to the handmade nature of the flowers,some variations might occur from pictures.Slight variation in colors may happen.Pictures are usually sent of the products of custom order to confirm the colors.Some colors/paper may bleed due the the nature of crepe paper.The flower may require fluffing.